I awoke yesterday morning with just a twinge of rising excitement. Later in the day, we would be off on a 200km road trip to watch Hull City in their European debut. Sometimes, you do get the feeling that events conspire against you though on days like this one and yesterday turned out to be challenging…..
At around noon, as we made final preparations to leave, the skies opened. 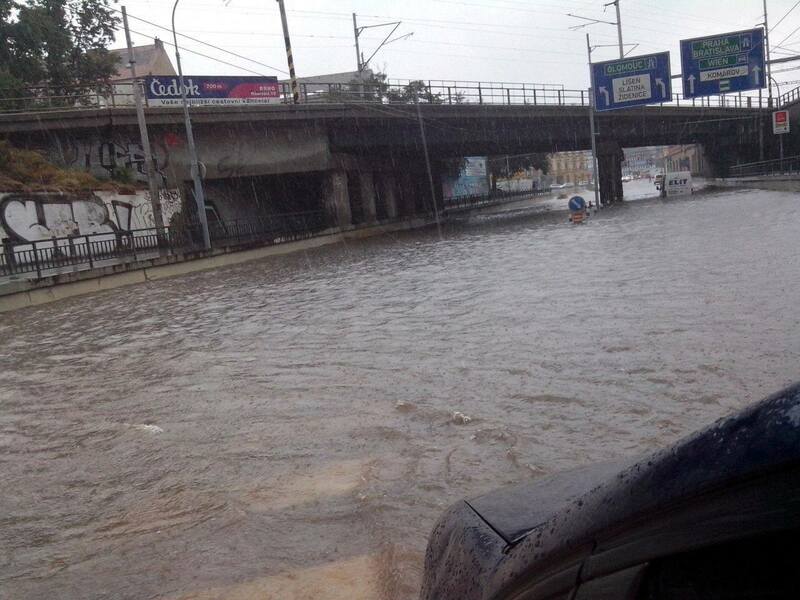 It rained so hard, Brno streets flooded within 30 minutes. Really, I have never seen so much rain here in the 7-years I have lived in the Czech Republic. If it was raining like this in Zilina there would be no game at all we thought. A check of the internet held out hope. The rain was more or less north-south and the heaviest was in Brno. It seemed to extend only 20 – 30 km east and the forecast for Zilina was still OK.
We were due to pick up 3 friends at 2pm just around the corner. On leaving in the continuing downpour, the first thing I noticed was the traffic jam. It turned out, the city center had some serious flooding and traffic was total chaos as a result. What should have taken a minute or two ended up taking 20 minutes as we crawled through the streets. Even worse, our friends had got soaked and needed to go home and pick up a change of clothing…..the rain continued falling in buckets. By 3pm, we had managed to reach the village just outside Brno and our friends had changed. Off we set. Through flooding and heavy rains we drove at 40km/hr. If the weather was going to be like this for much longer we may not make it for kick off! At one point, we hit another traffic jam on the road to the Slovak Republic as water rushing off the fields to the right of the road swirled in torrents across the road bringing mud and rocks with it and even eroding the highway. It was that bad! After 60km, the rain began to ease. By the time we reached the border, there was a hint of sun. By the time we reached Trencin, it was partly sunny and warm. It was 5pm and we were going to make it after all. Arriving in Zilina, we decided to go straight to the ground and have a beer. It was a small town and the ground was easy to find. 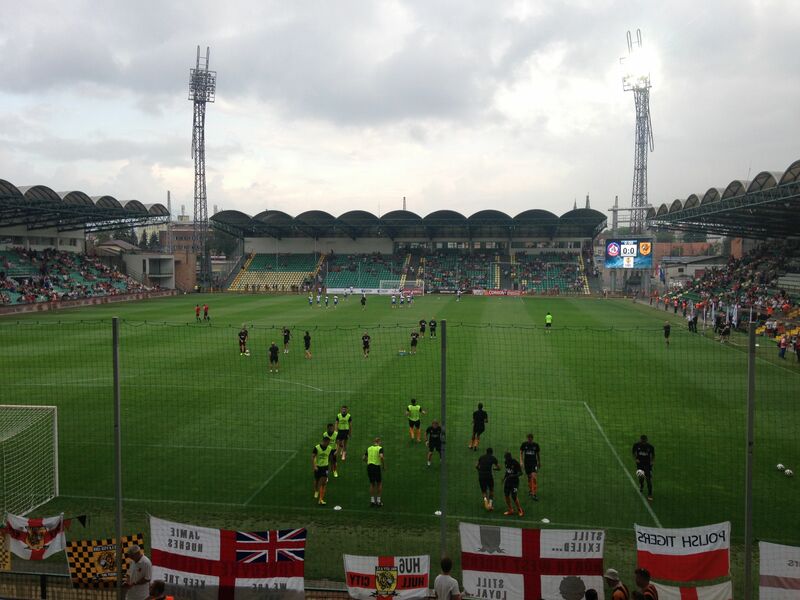 People in black and amber seemed to be everywhere as the invasion of Zilina by the 600 or so Hull City fans took shape. 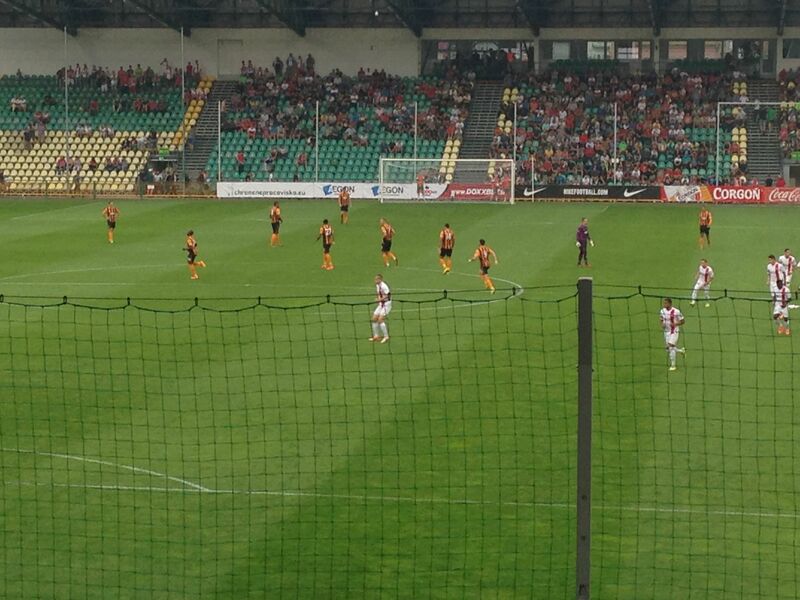 Local fans looked on in amusement at full grown men dressed as Tigers! The ambience was good though. The next challenge was to find our tickets. We were looking for one Alan Mabbutt of the Hull City ticket office at the away turnstiles. As you may guess, we walked around the entire stadium before arriving pretty much where we started to find the away turnstiles. There was Alan with our tickets. By now, I was like a small kid bubbling with excitement. We were body searched entering the stadium and I think I confused security by speaking Czech to them when they expected English. Once inside, it was just amazing. 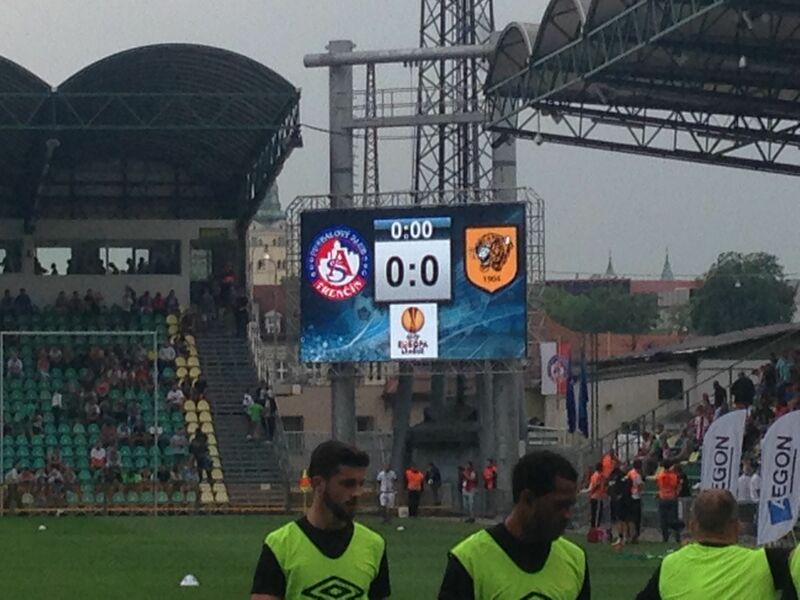 Flags were strewn across the away end – Polish Tigers read one while another said Warsaw Tigers! The team were warming up and again, I was like a kid pointing out all the players to my partner. Livermore waved at me too – or maybe her…. who knows? Shortly the game began. It really wasn’t the greatest of games. 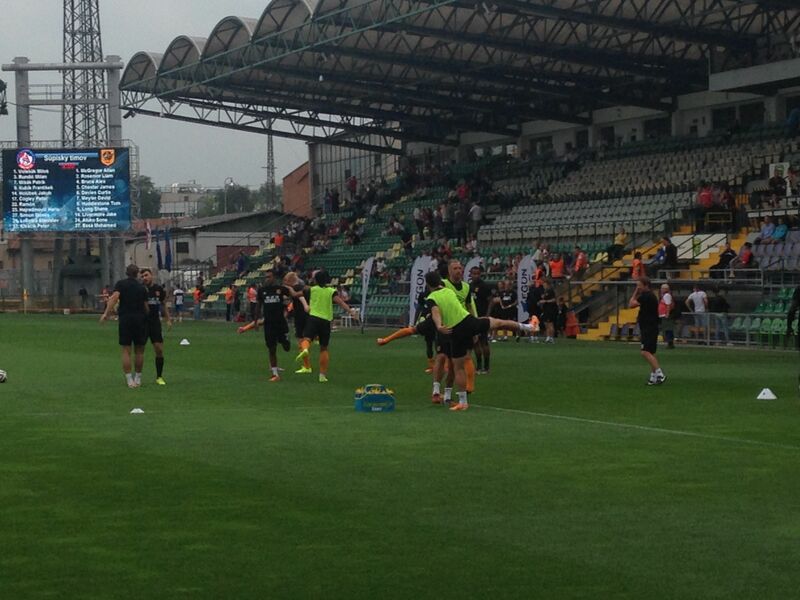 Hull City are really still in training for the season and they looked a bit out of practice and out of synch. Huddlestone missed a penalty and the rebound. But it was fun with the City fans making a lot of noise and singing/chanting all game long. We got a look at new signings too as they came on as substitutes later in the game and they looked to hold a lot of promise. It finished as it started at 0 – 0. The return leg in Hull is next week and Hull should win it. But it was a great experience and very enjoyable. The trip home was rapid and uneventful. The rain that had so nearly upset all of our plans was gone and there was little or no sign of any flooding….